Predictable Printing! All our enlarger timers use our straightforward and logical “constant density” method of timing, otherwise known as “the f-stop method”. It’s the same system you’ll find in your camera. When applied to printing it results in smooth and consistent exposure changes with predictable results on the paper. It makes judging exposure much simpler and makes burning in a breeze. 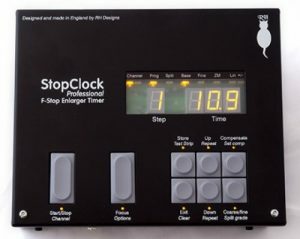 See the F-stop Printing page for more information about this easy and logical system!